ALL benefits-eligible employees MUST sign up for benefits during Open Enrollment, even if you are not making changes to your selections. 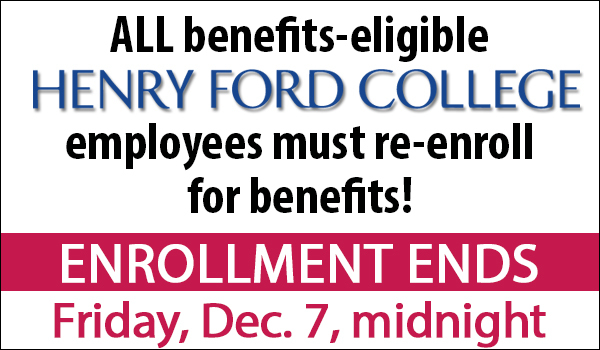 Open Enrollment takes place Monday, Nov. 26, through midnight on Friday, Dec. 7. If you do not sign up by midnight, Dec. 7, you will not be able to sign up for 2019 benefits. The entire process should take approximately five minutes. Please start by logging into BenExpress at www.benexpress.com/hfcc. You may also put the URL into your smart phone and enroll with your mobile device; there is no app to download, you must type or cut/paste www.benexpress.com/hfcc into your browser on your smart phone. You will be prompted to enter your user name and password. Your user name will be the first initial of your first name and then your complete last name. If you do not remember your password from last year, there is a "trouble logging in?" link at the sign-in prompt that will allow you to reset your password. Monday, November 26 to Friday, November 30, 9:00 a.m. – 10:00 a.m. and 3:00 p.m. – 4:00 p.m. Monday, December 3 – Wednesday, December 5, 9:00 a.m. – 10:00 a.m. and 3:00 p.m. – 4:00 p.m. If you have questions, please feel free to contact HR at hr@hfcc.edu or extension 9820.